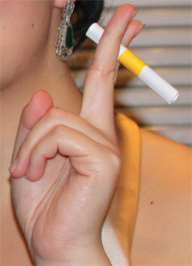 At my birthday party this year, my friend An handed me something that looked like a prop cigarette, but was actually a piece of paper wrapped up tightly and sealed with a yellow post-it note. And on that little piece of paper he'd typed: "Vue De Monde - Saturday 11 June". It was a double birthday present for Sandra and I! Squeeeeeee! I'd never been to Vue de Monde before, so I was glad that we got to experience the old, Normanby Chambers venue, before their move to the Rialto. I'm sure the new dining room will be stunning, but I just loved the warm feel of the decor and the bustling atmosphere of Normanby Chambers. We were seated next to the kitchen, right in the middle of all the action, and got to see plate after plate of intricate food being ferried out by dozens of skilled waiters. 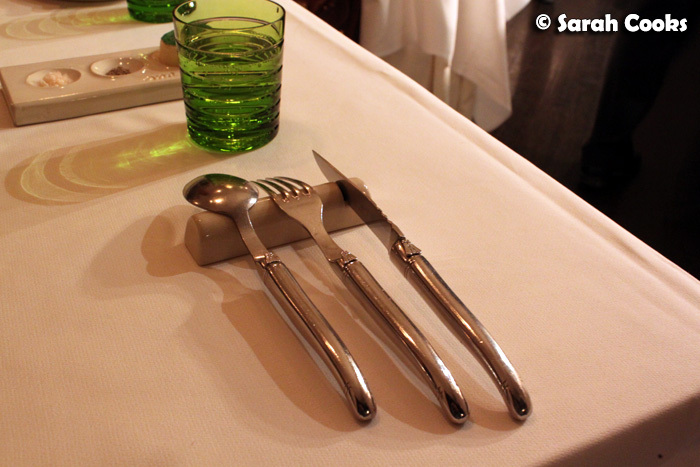 The service throughout the evening was fantastic: the right level between friendly and efficient. They were also very switched-on and attentive. For example... when our waiter noticed that I was hurriedly scribbling down notes on the meal (not just for the blog, but also so I could actually remember all the different courses we were enjoying), he came over and informed me that they could just email us all the details of the food and wine - phew! I believe they offer this to all tables, but usually at the end of the night! There was actually only one negative I can think of: throughout the evening, four separate waiters topped up our water glasses with still water, even though we were all drinking sparkling. It wasn't a big deal at all, and was rectified instantly - we found it funny more than anything else! 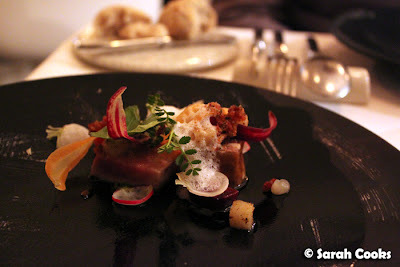 An said we could do the ten-course degustation - YAY! ... oyster remoulade in a citrussy gelatin casing, and a small pot of house-made yoghurt with macadamia praline for our non-seafood eater! I chose to do the matching wines as well. Don't worry, I paid for them myself - I wouldn't have made An shout me wines too! After the amuse bouches, the sommelier came over and asked for my wine preferences - oaky whites, any reds, but happy to try anything - and explained how the matching wines work. There was a small glass (60ml) of wine per course, priced at $15-$17 each. I thought this was a great way to enjoy a variety of premium wines, without getting too intoxicated (or broke!) over the evening. Having said that, they're flexible, and you could go super-premium if you wanted! 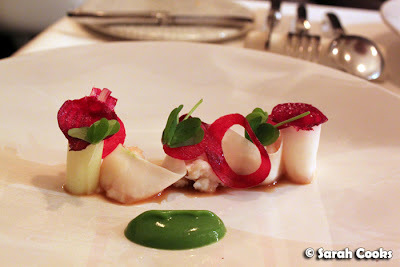 I loved the pretty, vibrant colours of this dish, the freshness of the crab and the crunch of the vegetables. The accompanying Vermentino was accordingly fresh and crisp - despite my preference for oaky whites over fruity ones, I thought this was a fantastic match. 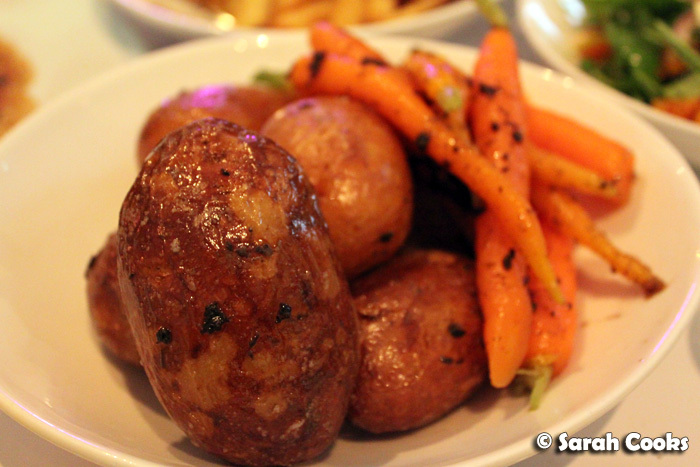 How cute is the potato dish! 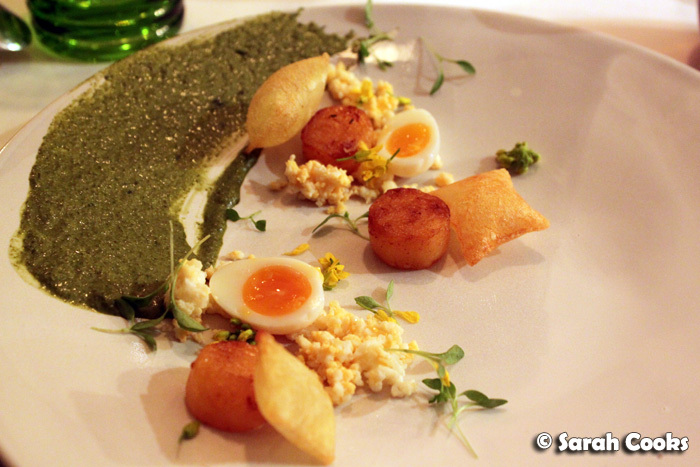 I thought it looked like a pastoral scene, with its swipe of tarragon sauce, perfectly cooked quail eggs, sprinkles of herbs and little potato pillows. The second course was more theatrical. First, we were brought shallow bowls topped with mushrooms on wooden boards. 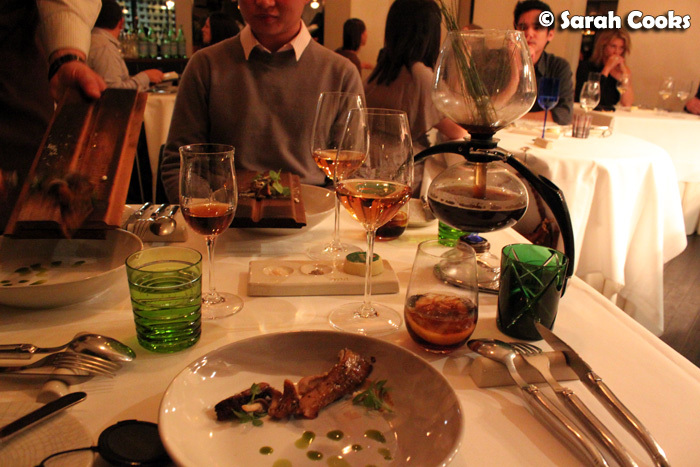 A coffee percolator filled with konbu-infused mushroom consommé and pine needles was brought to our tables, and heated up. 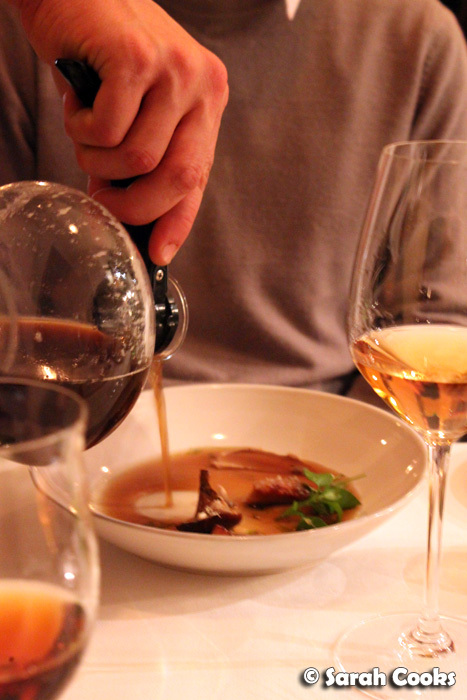 The consommé bubbled up from the bottom bulb into the top, and once it subsided, our waiter scraped the mushrooms from the board into the bowls, and poured the consommé over. This was, perhaps, my favourite course of the evening. I loved the spectacle of the dish, the intensely savoury mushroom broth, and the meaty texture of the mushrooms - absolutely delicious! This course came with a Spanish sherry, that had a very short finish. On first sip, I wasn't a huge fan, but when tasted with the soup, it was a lovely combination. 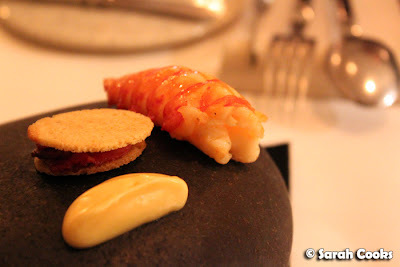 I absolutely adored the third course - incredibly fresh marron with a little beef tongue sandwich, and a decadent brown butter emulsion. I'm sure there were a zillion different elements going into the preparation of this dish, but to me it tasted simple, and perfect. On less formal occasions I'd love to have a big plate of marrons, drowned in that brown butter sauce, as my meal in its entirety! 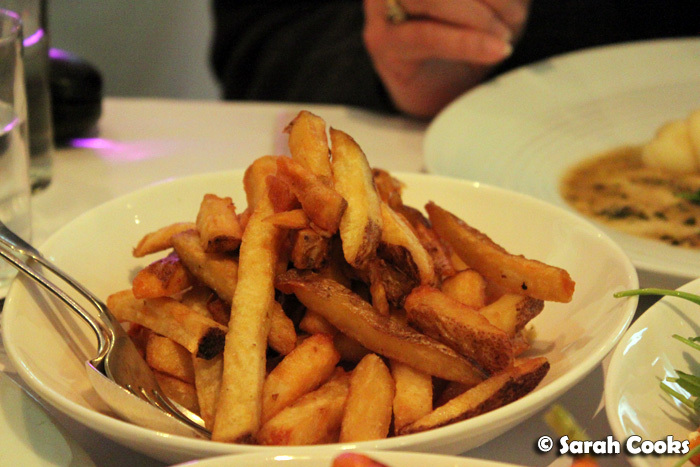 We really appreciated how the our non-seafood eater wasn't just given the vegetarian option during the seafood courses, but often a completely different dish altogether. Yes, you read that correctly! Dom Pérignon and truffles! 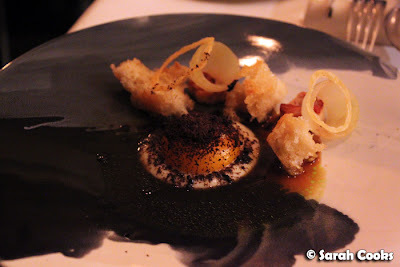 In addition to the softly-set duck egg yolk sat atop white polenta (I believe), there were ciabatta croutons, onion rings (both pickled and fried), sweetbread sausage, and a delicious dark jus. 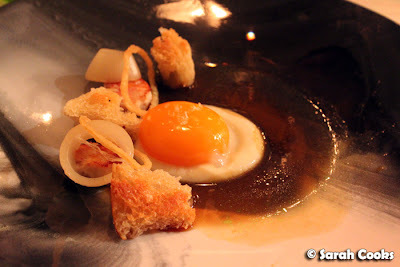 There were great contrasts in the dish: the richness of the egg yolk against the sharp pickled onions, the soft egg, onion and sweetbread sausage against the crispy ciabatta and fried onion pieces - just lovely. And of course... there was black truffle, which our waiter grated over our individual plates. Sandra actually said "no thank-you" to the truffle (OMG what?! ), because she's not super-keen on them, and she'd been "forced" to sit through a 4-course truffle lunch at The Atlantic the day before. And you thought I was lucky! I was almost going to ask him to grate Sandra's share of truffle over my plate, but thought it might be poor form! I'd been too preoccupied eating, but An said that the chef had seen me greedily mopping up extra sauce and had yelled at one of the other chefs: "Quick, quick, more sauce! ", and then ran over to our table to give me more. Hilarious! (Slightly embarrassing, but still hilarious!!) See what I mean about them being friendly, attentive and switched-on? And now, a little palate cleanser. 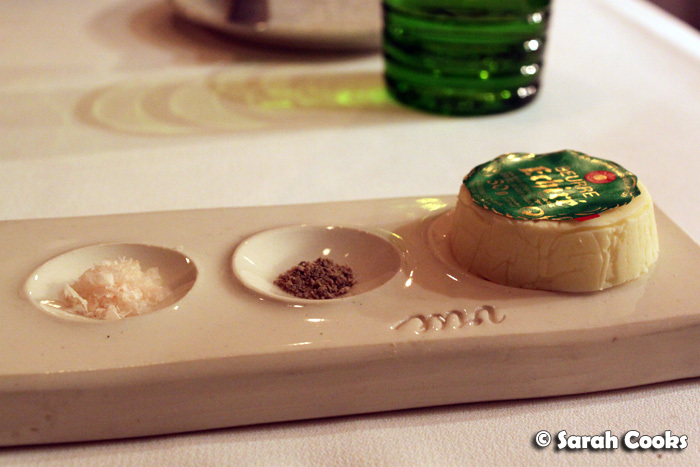 We were given little bowls of herbs, over which our waiter poured dry ice. 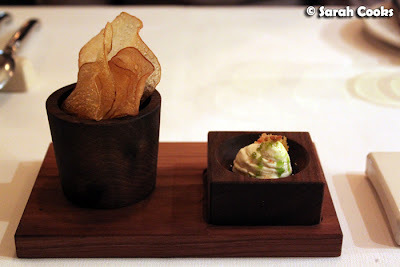 We had to shatter them using a wooden pestle, and were then given a quenelle of cucumber sorbet. 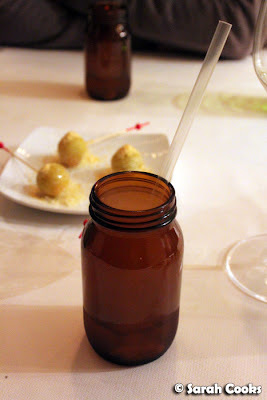 It was an unusual sorbet, which tasted like pure essence of cucumber - the cold and smooth texture somehow amplified the refreshing qualities of cucumber. Fish and shiraz - not a combination I would have thought to put together, but it worked well. From memory, during the evening our waiter said the tuna was caught in Australia, which made me think it wasn't an endangered species of tuna. (I hope!) I almost never eat tuna, so this was a rare treat for me. 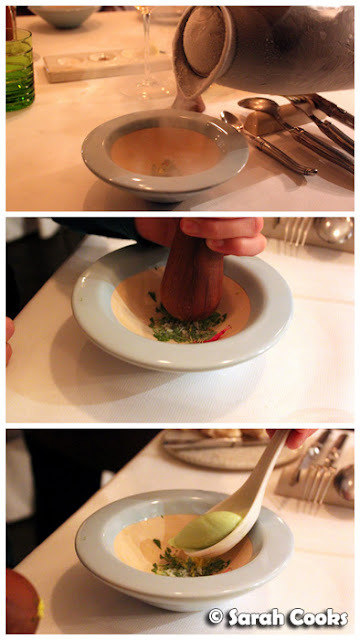 We weren't quite sure what "warm mayonnaise" would be, but it turned out to be like a wonderful hollandaise sauce. 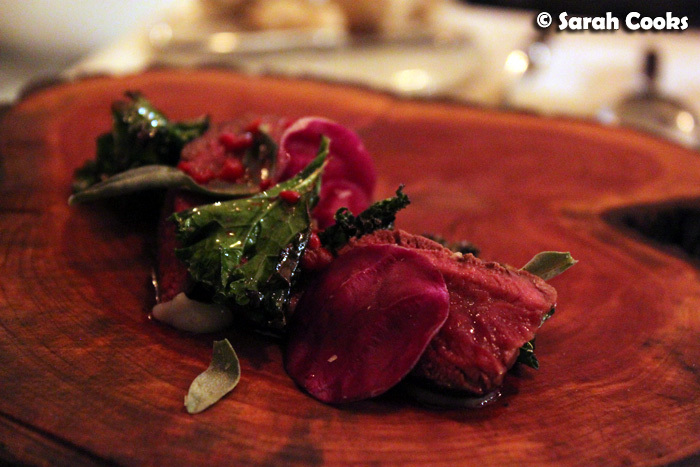 Instead of ordinary plates, the kangaroo was brought out on thick slices of wood. You can see above it was cooked rare - perfect for me! - but Sandra's one came out well done, just as she requested. I greatly enjoyed the green leaves: salty and crispy little bites, which complemented the sweet kangaroo meat well. 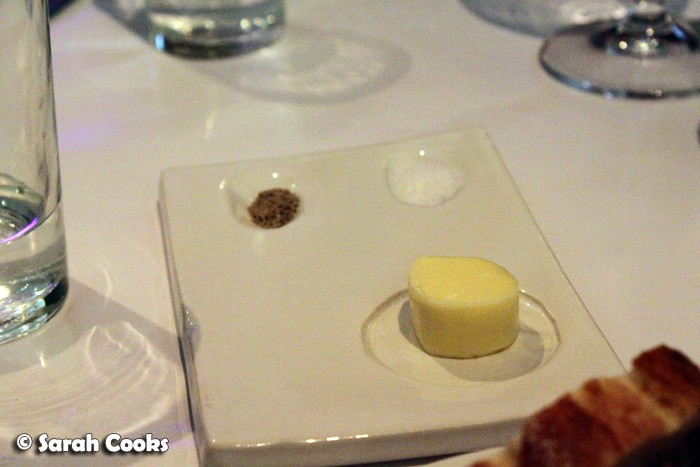 Phew, our final savoury course of the evening. 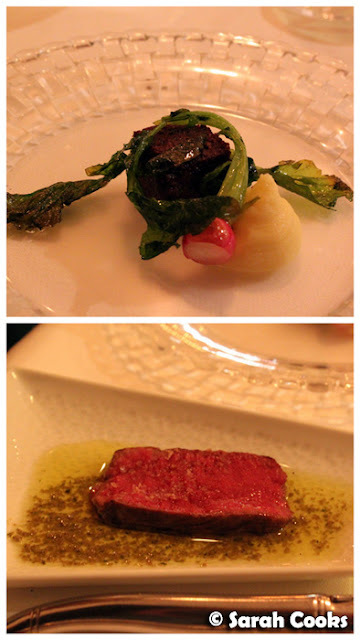 There were two plates: one with a cube of meltingly tender beef cheek with mashed potato and radish, and one with a rare piece of beef with a dill, anchovy and caper sauce. (That was a well-done piece of meat with dill and caper sauce for Sandra!) We were impressed that they made the non-anchovy substitution for Sandra - it would have been an easy thing to overlook. 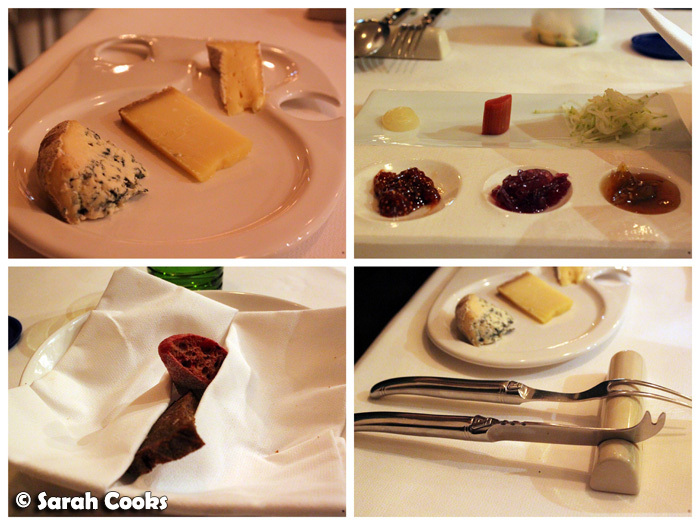 I was, unsurprisingly, quite full by this stage, but I really, really wanted to have a cheese course. (Walking through the restaurant during the evening, I'd walked past the cheese table: at least a dozen different cheeses, tantalizingly covered with a cheesecloth). Our waiter quizzed me as to my cheese preferences - I enjoy all cheeses, except washed rind! - and he made up a selection for me. There was a sharp Beaufort, a creamy Camambert and a mild Bleu D'Auvergne. 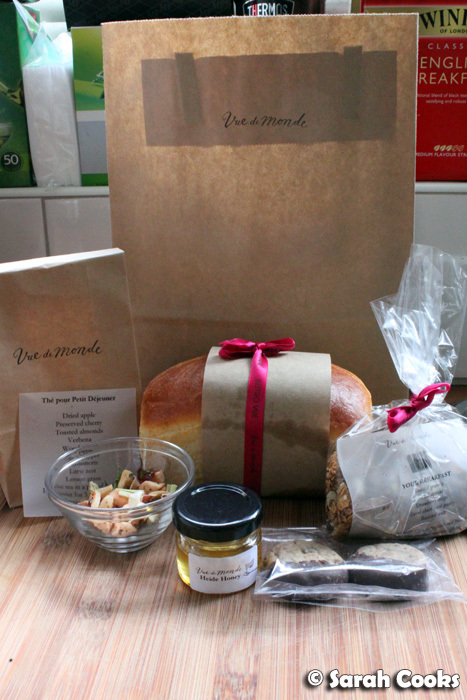 Accompaniments included freshly grated apple, rhubarb, pear puree, red onion jam and fig jam. He also explained which accompaniments matched best with the cheeses, but that I should have fun trying different combinations. The accompanying breads were a rye, and beetroot. They were rather crispy - I wondered if they'd been brushed with oil and grilled or fried. Our non-cheese eaters weren't ignored. They both got a cute pre-dessert, served in a yoghurt pot. 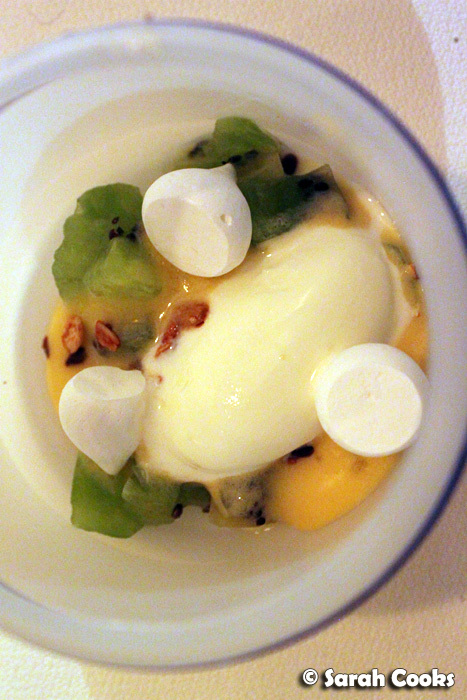 There was yoghurt, little meringues, kiwi-fruits, a sprinkling of toasted muesli, and a 'champagne supernova'. I found the cheese platter quite generous; I think it could easily be shared between two people, especially if you only want a few little tastes. 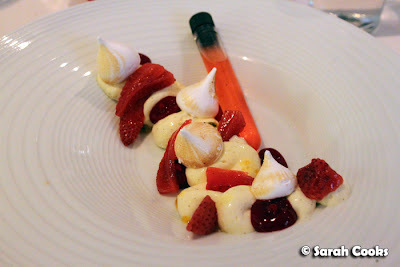 So, between cheese and dessert (yes, I know how gourmand that sounds! 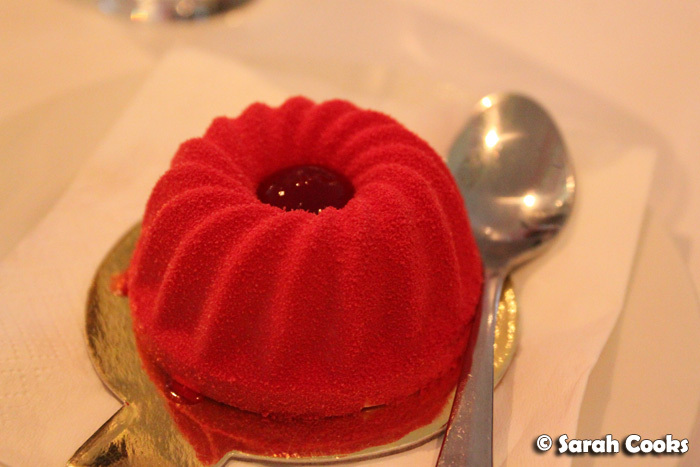 ), we had a little entremet sucré of house made lemonade, frozen toffee apple, and popping candy. 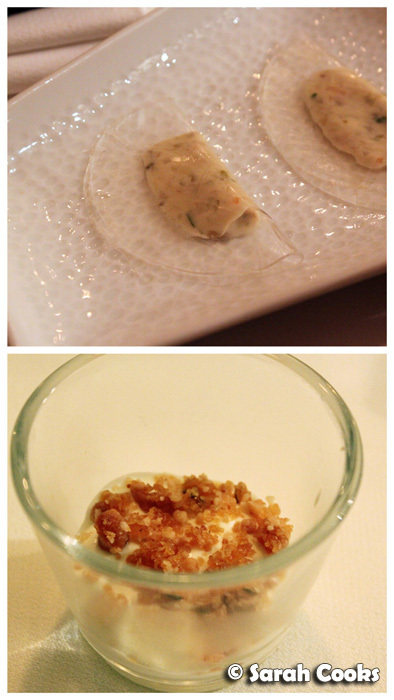 The first (of two) desserts was Vue de Monde's take on a Weiss bar, which included many different versions of mandarin in the one dish. I don't ordinarily even like mandarins, but this was fabulous! 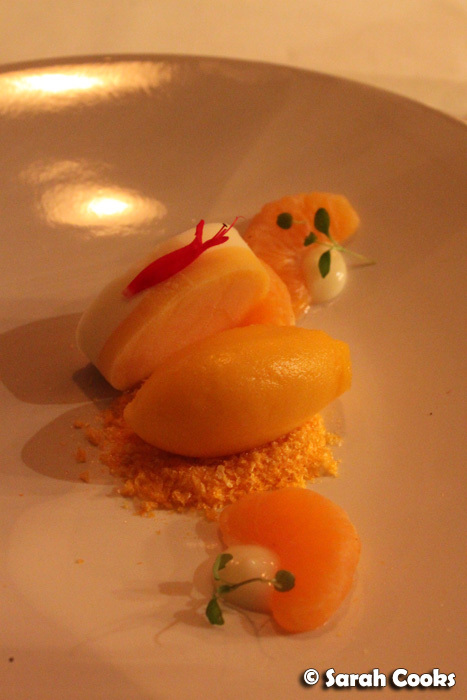 There were fresh mandarin segments, a quenelle mandarin sorbet, crunchy dehydrated (?) 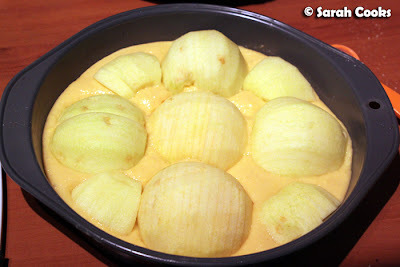 mandaring pieces, and the "Weiss Bar", with a layer each of mandarin and creamy milk ice-creams. This came with a South African sweet wine, the Vin de Constance. Out of all the wine matches, this was the only one that didn't work for me - even though the wine was lovely by itself, I found that it seemed to muddy the pure, delicate flavours of the dessert. But wait, there's more! The evening ended with coffees and some petits fours: sour lemon drops, chocolate mousse 'lamingtons' filled with raspberry jelly, mint marshmallows, and fruity candy in a sherbet powder. 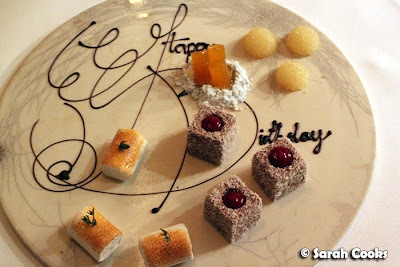 I thought it was super-cute how they'd written Happy Birthday on the plate as well! We had the most fabulous time at Vue De Monde - before visiting, I thought it might be a little stuffy but it was actually a lot of fun! It's undeniably expensive, but definitely worth saving up for and visiting for a special occasion! 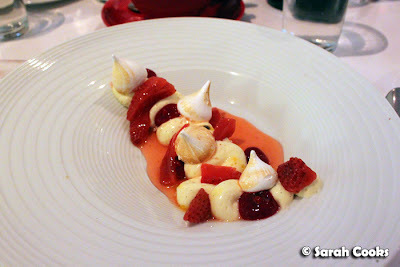 (Although, apparently the new Vue De Monde has an à la carte menu as well, so that might make it a bit more accessible.) 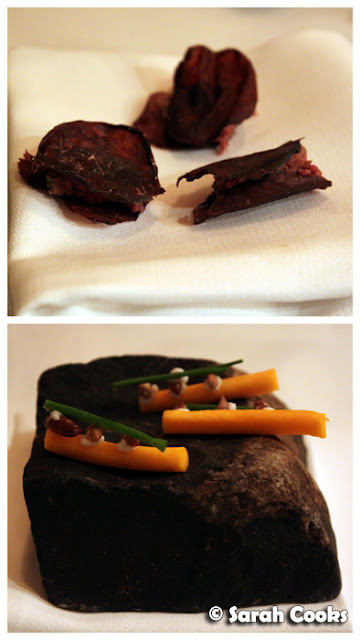 More than just the food, the entire experience was just amazing - the pride that the staff have in their restaurant is palpable, and I loved the amount of thought and effort that went into making sure we had a fantastic night and enjoyed the experience. A big thank-you to An for one of the best birthday presents ever! Now the question is: where on earth do we take him for his birthday later this year? Suggestions please!!! 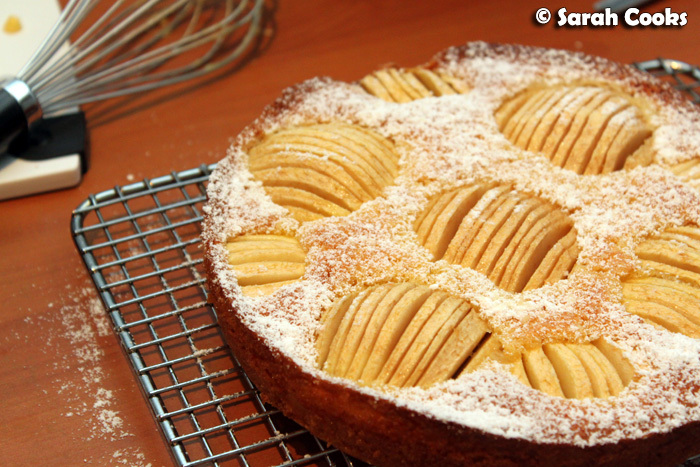 An Apfelkuchen, sehr fein, is a classic family-style German cake. 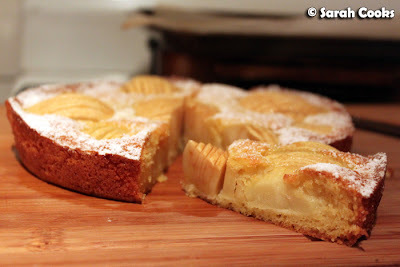 Sliced apple halves, just held together by a vanilla-scented, buttery batter - wunderbar! I imagine it's perfect for afternoon tea or Kaffeklatsch, but I made one tonight for a little mid-week treat. Recipes for Apfelkuchen can be found in almost any German baking book, (or indeed, here, via the wonders of the Internet!) but because I only wanted to make a small cake, I used a recipe from the gorgeous Dr. Oetker Mini Kuchen book. 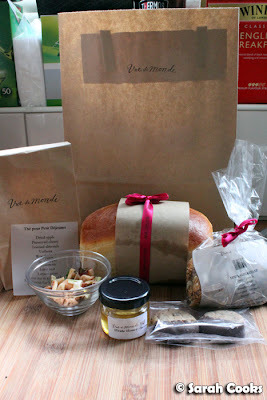 It was a gift from the folks in Germany, and I love all the cute mini-Kuchen, Torten, Hupfs and Obstbodens! Sehr niedlich! 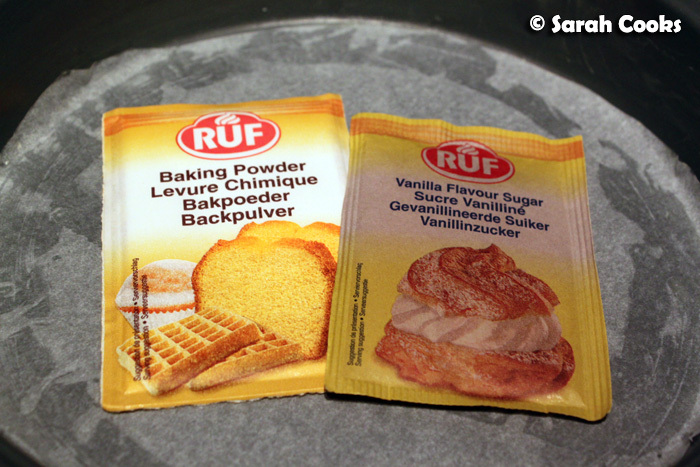 For a truly German-tasting cake, you need little Päckchen of Vanille-Zucker and Backpulver! These are available at many delis and larger supermarkets in Melbourne, but you could always substitute ordinary vanilla extract for the vanilla sugar. I mixed the dough by hand, as it didn't seem worth it to drag the KitchenAid out for 40 grams of sugar and 50 grams of butter! I also didn't have an 18cm tin (another thing to put on the shopping list! ), so I used a 20cm sandwich tin. ...but after 30 minutes in the oven, it rose heroically to look like a proper Apfelkuchen. Hurrah! 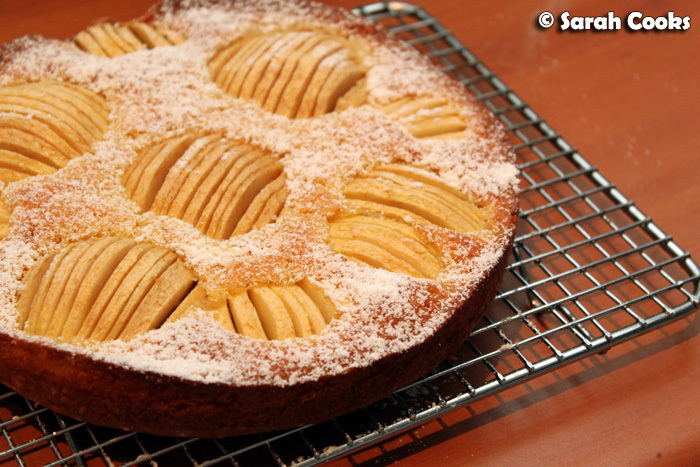 The recipe asks you to glaze the top with apricot jam, but as you may remember from my last post, I didn't have any. I just finished off the cake with a simple dusting of Puderzucker. A piece of cake, a cup of tea, a double episode of Law and Order: SVU on TV. A perfect relaxing night in! Line and grease an 18cm springform tin. 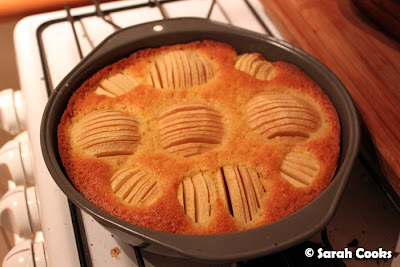 (A 20cm tin will also do; the cake will simply be a little flatter). Sieve the flour and baking powder into a bowl and set aside. Beat the butter until soft and light. Add the sugar, vanilla sugar and salt. Beat together until smooth. Add the eggs one at a time, beating for about 30 seconds in between. Add the flour and mix in. 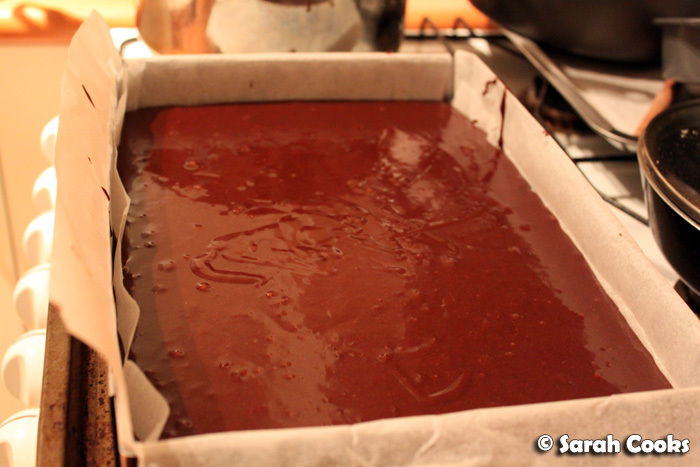 Pour the batter into your prepared tin, and spread out evenly. Peel and core the apples, and cut into halves. Use a sharp knife to score lines in the apple pieces, being careful not to cut all the way through if possible. Arrange the apples on the dough, pressing in lightly. Let the cake cool for 10 minutes before removing from the tin. Dust with icing sugar to serve. Ta-dah! 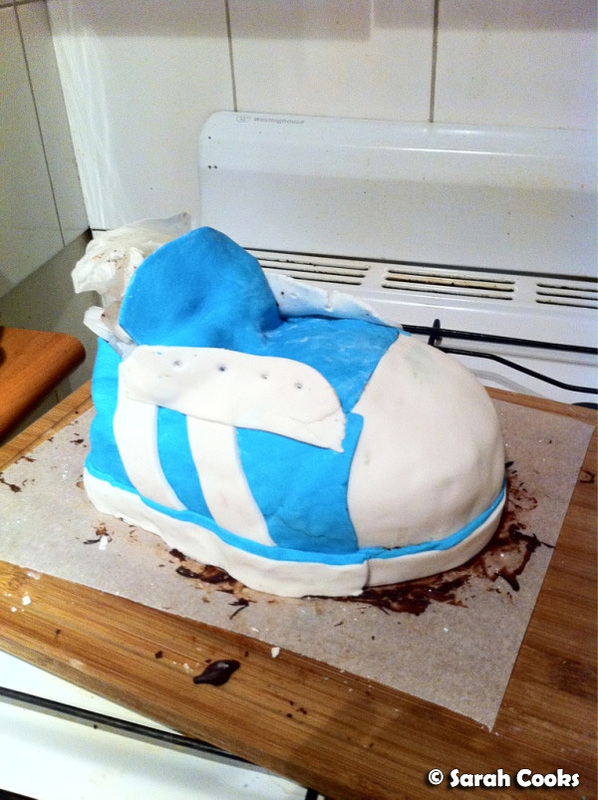 Last week I made a fancy shoe-shaped cake! It was for a work function where we were all meant to bring a dish, and I wanted to bring something a little special and fun. It was the first shaped cake I'd ever made, (i.e. a cake that doesn't look like a cake). It turned out a little messy, but overall I was very happy with the results, and more than a little proud of myself. Apart from a plain round Christmas cake last year, I'd never covered a cake with ready-to-roll icing. And it was actually super-fun, if a little messy! I used recipes, tips and techniques from the Planet Cake cookbook to make the shoe-cake. I didn't have a plan to follow to make the shoe, but I'd taken a bunch of pics of the original shoe on my phone. From the pictures I figured out what the shape of cake itself would need to be, and drew myself some diagrams of the different pieces of icing that I would need. Two days in advance, I made a single quantity of Planet Cake's chocolate mud cake in a big slab. I absolutely love this cake! Not only does it taste and smell fabulous (thanks to loads of melted dark chocolate and espresso powder), but it rises evenly while baking - no domed tops here! It's perfect for building shaped cakes. As an aside, I just realised I've only ever made the chocolate mud cake from the Planet Cake book. I must try the others - the white chocolate mud cake, the carrot cake, and the flourless orange cake all look great too! The next day (i.e. the day before we were meant to eat the cake), I shaped it and iced it. One of the Planet Cake tips is to use ganache to sandwich the cakes pieces together, and to smooth out any bumps - way tastier than the almond icing that many bakeries use! So this is the way it went: I cut out a base shape for the cake, then built it up into a 3D shoe shape with extra pieces of cake, using ganache to stick it together. 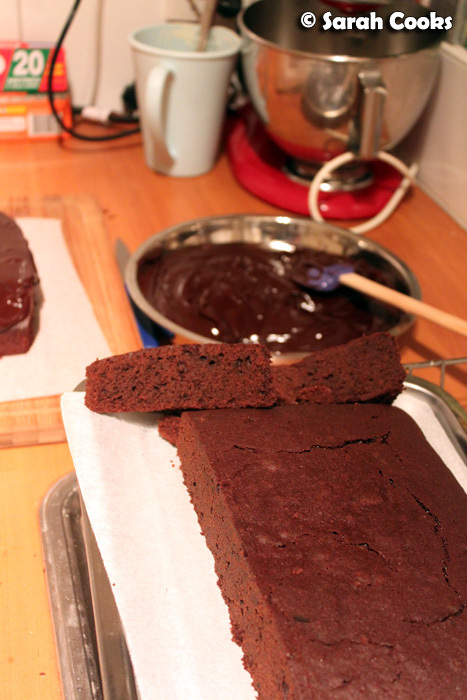 Once the ganache had set, I scraped a hot pallet knife across the entire surface to make the outside (reasonably) smooth. I then rolled and cut out the pieces of ready-to-roll icing that I needed. I used cherry jam to stick them to the cake. The Planet Cake recommends apricot jam, but the apricot jam I had in the fridge had, unfortunately, gone mouldy, so I used cherry jam, being careful not to let it stain the outside of the finished cake. As a bonus, the combo of cherries and dark chocolate is heavenly! Finally, I let it dry overnight and took it to work the next day. And here we can see the building of the cake... thanks to the amazingly talented Sandra for making the animated gif for me! As I mentioned before, it certainly wasn't perfect (and definitely not, say, in the league of a Delectable-style cake), but it was cute and it looked like a shoe, and I was proud of my little achievement. We auctioned it off at work and raised $100 for charity! Oh yay! Those of you who follow me on Twitter will know that I was lucky enough to have a full-on, blow-out 10-course degustation dinner at Vue De Monde on Saturday night. It was a totally amazing experience, and I'll be blogging it just as soon as I sort through the gazillion photos! 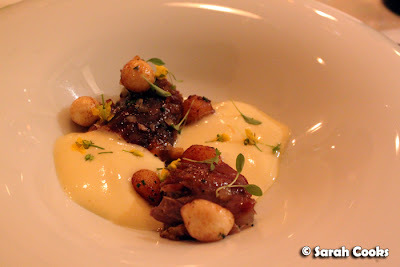 In the meantime, I'd love to share with you a meal I enjoyed at another of Shannon Bennett's restaurants last fortnight - a lovely little celebratory dinner at Cafe Vue at 401. For our celebratory family dinner, we wanted to go somewhere special but low-key. 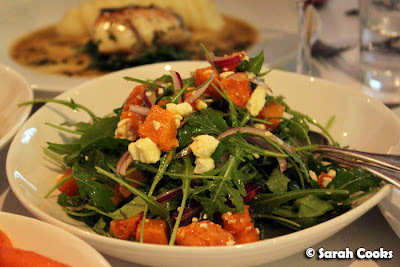 Cafe Vue at 401 fit the bill perfectly! (I have previously visited for lunch, and for dinner). They still do a $55 for 3-courses deal, but you are now restricted to a set menu of the day, rather than being able to choose anything from the menu. 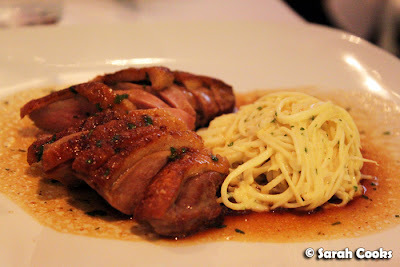 The à la carte menu still represents good value, however, with most mains generously portioned and in the $30-$40 range. We had a round of drinks to start: 2 cocktails (yay!) and a beer. 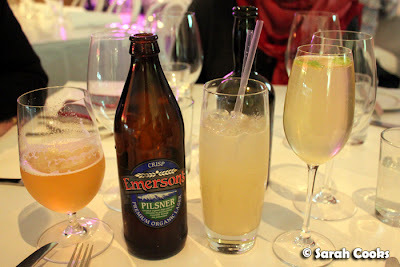 No surprise that the Un Paysan cocktail was mine - elderflower liqueur and sparkling wine - fabulous! 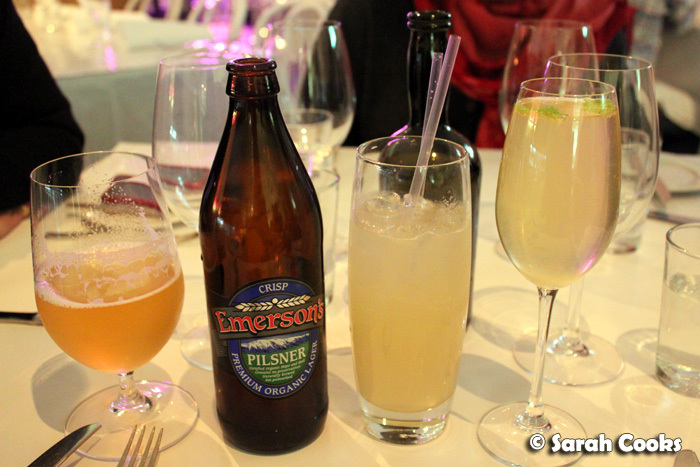 We ordered a Warsteiner, but were inexplicably brought an Emerson's Pilsner - not quite sure what happened there! We did have a couple of communication issues with our waitress throughout the evening - she was absolutely lovely, but had quite a strong accent, so sometimes it was a bit difficult for us to understand each other. But onto the good points: the food! 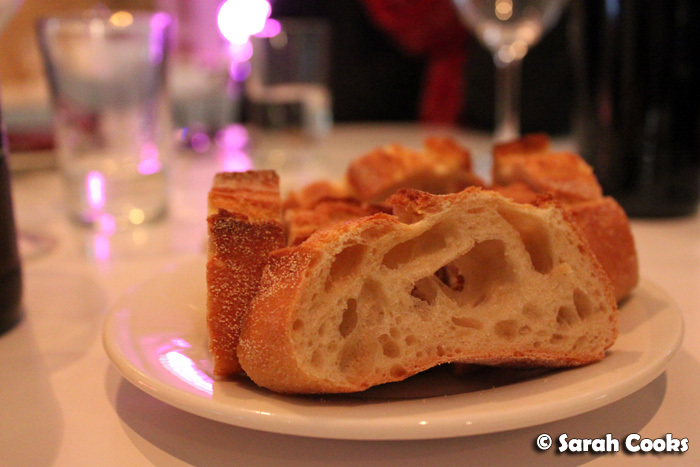 The bread was made in-house, refilled regularly, and delicious. I loved the cute butter plate! I'm such a crockery junkie - WANT! The second lot of bread was even better. It was brown bread, still warm from the oven. Soft on the inside and crusty on the outside. 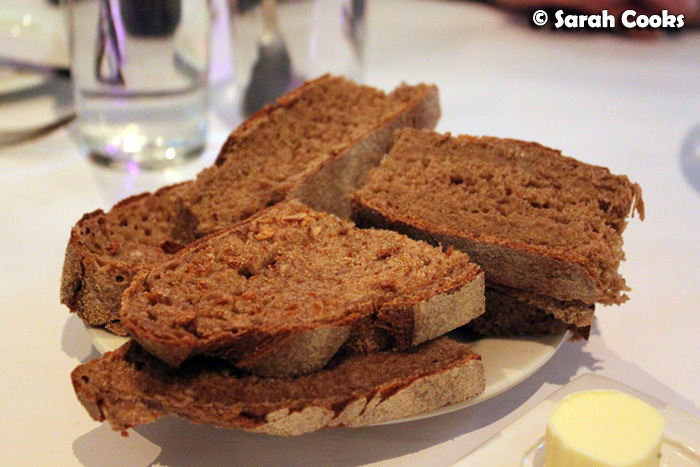 It reminded me of German bread, which, as we all know, is my favourite bread in the world! 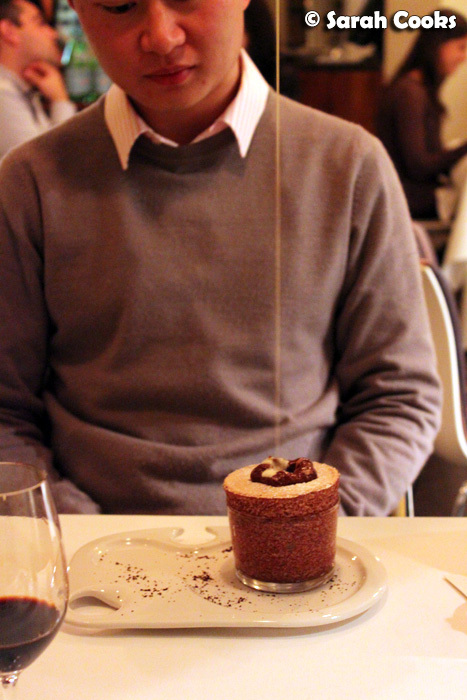 We skipped entrées and went straight for mains. It was a Monday night, after all! And I often struggle to do a full 3-course meal at restaurants anyway. 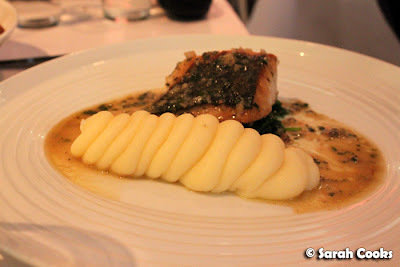 Mum ordered the pan-fried blue eye cod, which came with a super-creamy and buttery pommes mousseline. She absolutely loved this dish, with its fresh, tender fish and sharp sauce. 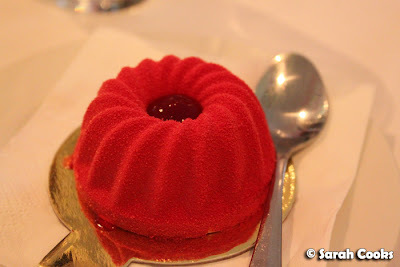 Sandra, my father and I were all in the mood for something a little more substantial, and each chose from the rôtisserie section of the menu. The rôtisserie dishes all come with a celeriac remoulade, a dark jus and vegetables cooked in the rôtisserie. 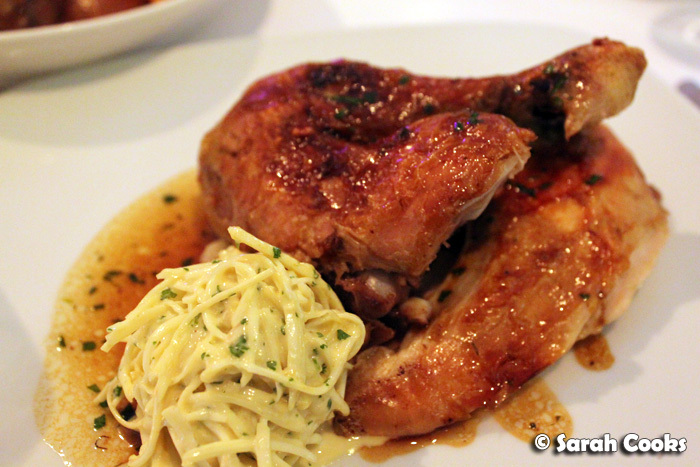 The chicken was the standout dish: it was incredibly tender, with a sticky, tasty skin. Apparently you can buy the whole chicken takeaway - how good would that be? 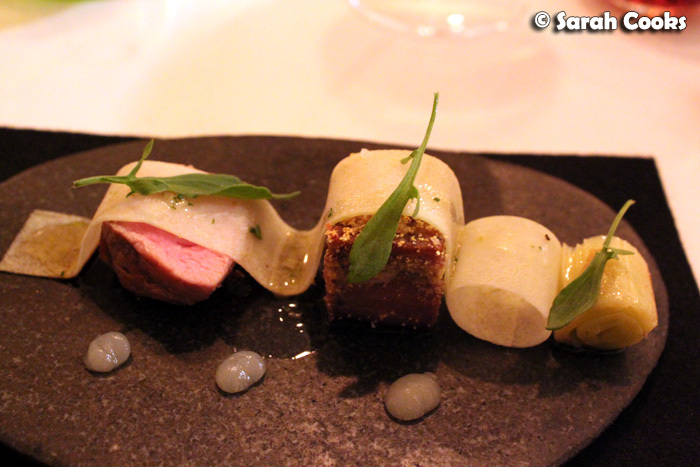 The duck was a well executed dish: slightly rare, very tender and juicy. The pork was the least successful of the rôtisserie dishes - it was very fatty, and the pork rind was unfortunately chewy rather than crisp and crackly. I'd definitely stick to the chicken or duck next time! We didn't realise the rôtisserie accompaniments would be quite so generous, so we'd ordered a couple of sides as well. We only managed to eat one potato and a few carrots between us, but luckily they let us take the remaining home with us. They made a fantastic lunch the next day! We couldn't not order the following salad, as it had all of my mum's favourite ingredients: pumpkin, feta and rocket. 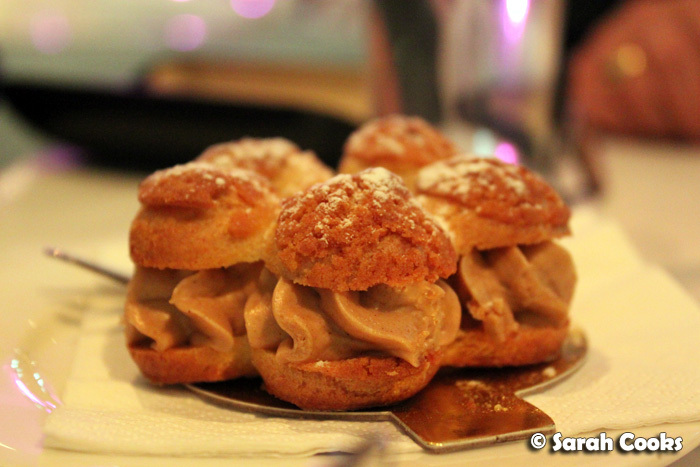 Paris Brest - $3.50 (Yes, really). But whilst the pastry cabinet was tempting, I couldn't go past the pavlova cheesecake from the dessert menu. I had no idea what it would be, but I knew I'd love it - two of my favourite desserts combined into one! There were swirls of smooth and mild cheesecake mixture (very mild, possibly based on fromage frais rather than cream cheese or mascarpone), crunchy little meringue blobs, and bits of strawberries, strawberry gelée, passionfruit and a strawberry-champagne sauce. Dee-licious. 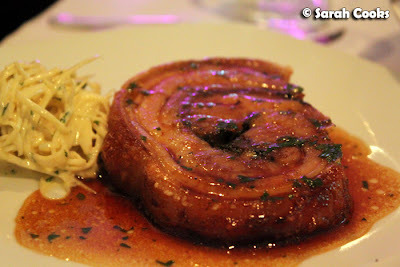 Despite a couple of small issues, we still really enjoyed our dinner at Cafe Vue. It's a great spot for an easygoing dinner, where you can enjoy a special, well-made meal without fighting maddening crowds or spending a fortune.